UB professor Natesh Parashurama remembers being woken up in the middle of the night, blindfolded and forced to answer questions posed by brothers in Alpha Tau Omega, the MIT fraternity he was pledging and hoped to join. Vice President for Student Life A. Scott Weber will oversee a committee to review each of UB’s 21 fraternities and 16 sororities with a focus on anti-hazing. Many UB students were shocked to hear about the fire that devastated the historic Notre Dame Cathedral on Monday. When I was four years old, I told my teacher I wanted to be a Tin Man actor. 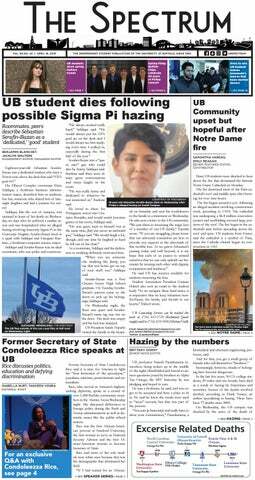 UB student Sebastian Serafin-Bazan died Wednesday after a possible hazing last Friday involving fraternity Sigma Pi. Fiona O’Loughlin is guilty of one fashion crime. R&B singer Kiana Ledé will open this year’s Spring Fest on May 4. On Wednesday, former Secretary of State Condoleezza Rice will be visiting our university as part of UB’s Distinguished Speaker Series. I will not be attending Secretary Rice’s speech as an audience member. Instead, I will be protesting her presence on campus as a “Distinguished Speaker” along with fellow members of UB’s chapter of the Young Democratic Socialists of America. Many UB students involved in Greek life were disappointed with President Satish Tripathi’s decision to indefinitely suspend all official fraternity and sorority events. ChoreoLab presented a full display of dance, lighting and projections in the CFA’s Black Box Theatre last weekend.